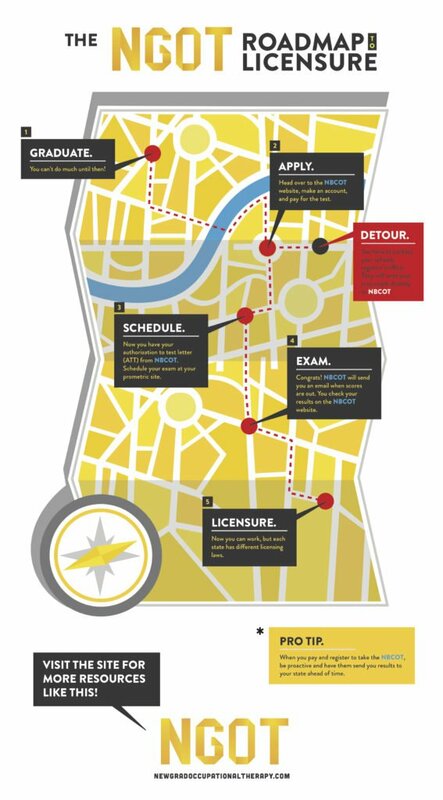 The path of OT registration and licensure is not simple or linear. With all the stress surrounding graduation and studying for the NBCOT, it can be hard to discern the process of the NBCOT. That is why we have created a resource (roadmap) to your OT registration and licensure. Down below you will discover a map with detailed instructions to help you along your final hurdle following occupational therapy school. Know everything there is about the NBCOT! 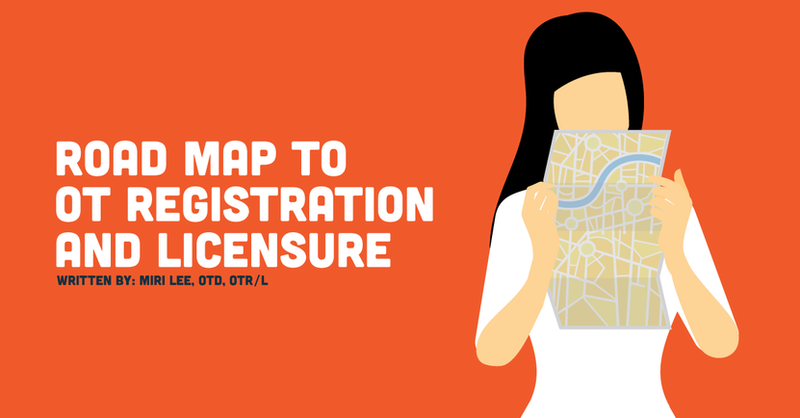 It’s tempting to seek quick, easy answers when trying to navigate the overwhelming process of OT registration and licensure. But, be sure to do your homework to learn everything you need to know about the certification process by reviewing the NBCOT Certification Exam Handbook. While it may be easier and faster to post your question to a Facebook forum or seek answers from a friend who recently passed the board, information is subject to change and you are ultimately responsible for getting the most up-to-date, relevant and accurate information. So, before you start planning your timeline or goals, be sure to go to the NBCOT website and download the Exam Handbook to learn everything you can about what may be one of the most important exams you will ever take. Testing Accommodation: To find out if you qualify for Testing Accommodation (TA), refer to the Testing Accommodation Handbook or email accommodations@nbcot.org for specific questions. Step 1: Create a MyNBCOT Account online at www.nbcot.org using a valid email address. This email is also where you will receive your Authorization to Test (ATT) letter, so be sure it’s current. Once you are logged into your account, complete and submit your application along with the application fee. Step 2: Submit the required documentation. AFTER submitting your exam application and payment, you must submit your academic verification documentation to NBCOT. Be sure to follow the directions found in the NBCOT Certification Exam Handbook for sending your official transcripts or Academic Credential Verification Form (ACVF). Step 3: Wait for your ATT letter. Within three business days, after NBCOT approves your application and required documentation, you will receive an Authorization to Test (ATT) letter by email. This letter will contain instructions on how to schedule your exam directly with Prometric, as well as information on how to reschedule or cancel your exam. Important to remember: The ATT letter is active for 90 days. That means you have to take the exam within this 90 day period. If your ATT letter expires, you’ll have to pay a fee, which ranges from $75-175 for each reissue. Once you receive your ATT letter, you can schedule your exam appointment directly with Prometric. Be sure to give yourself plenty of time to prepare for the exam. On average, students dedicate approximately 2 months to review and prepare for the exam, but ultimately, you are the best person to come up with a timeline that works best for you. Don’t compare yourself to the “norm” and don’t set your timeline based on what others are doing. Consider and assess your priorities and obligations as well as your current baseline and learning style to come up with a realistic timeline and schedule that will best position you for success. Honor the unique person that you are by reflecting on what makes YOU thrive and succeed. Believe that you can. Go in there as if you were already an entry-level practitioner and approach every question with an unwavering confidence, even when you are met with unfamiliar questions or diagnosis. Put on your OT thinking cap and rely on both your strong clinical reasoning as well as gut intuition to derive to the best answer. Be sure to pace yourself and follow these time management strategies and tips. Finally, silence the voice of defeat and remind yourself that you already have everything within you to pass this exam. Confidence matters. Every new grad OT needs an NBCOT study schedule.